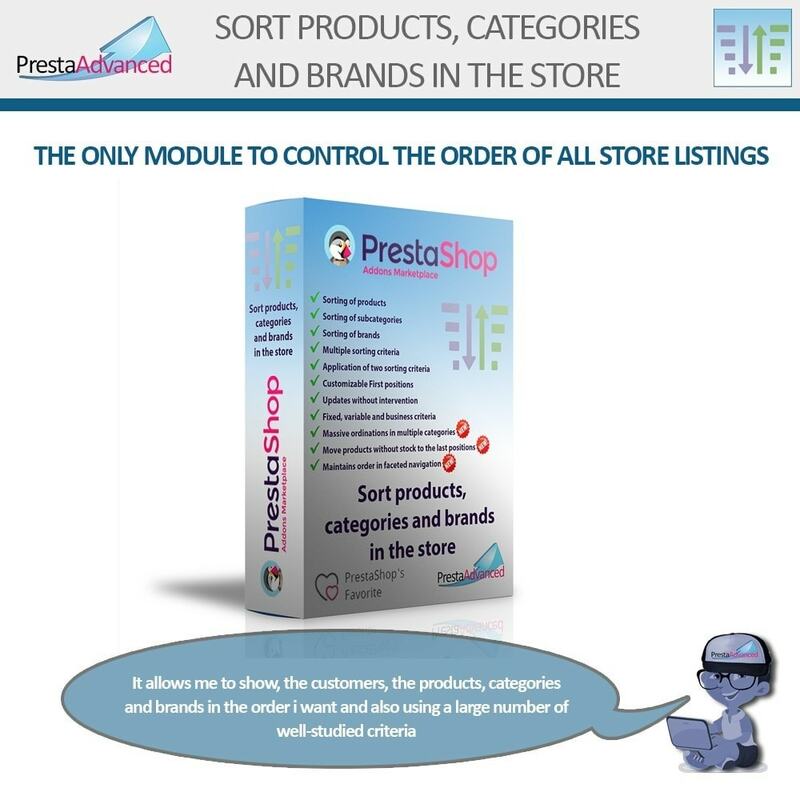 The module allows the merchant to define the order of the different elements in the listings of the store applying 13 shorter criteria with their respective orders increasing and decreasing. 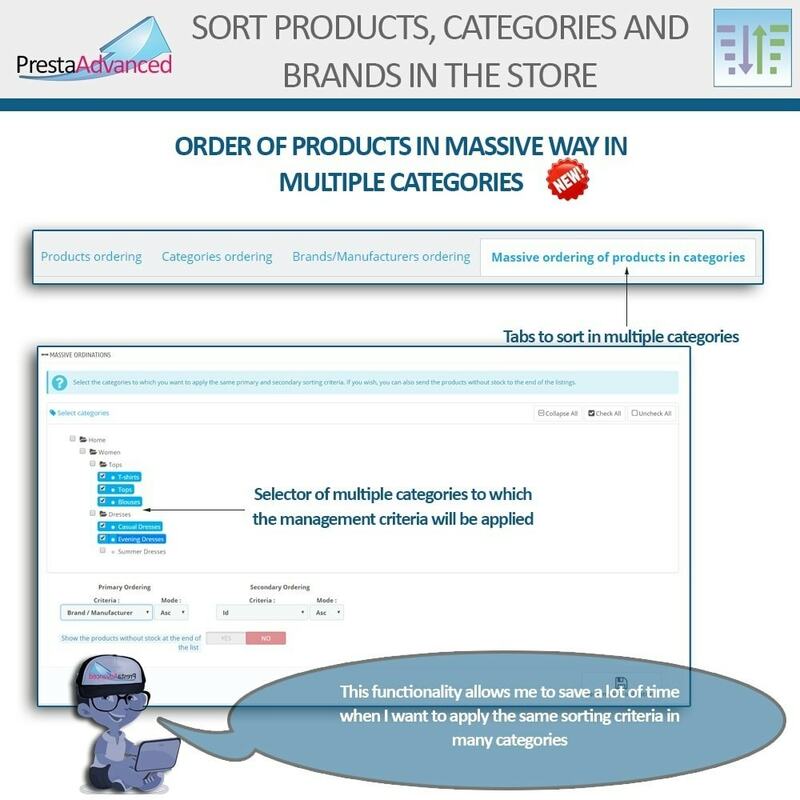 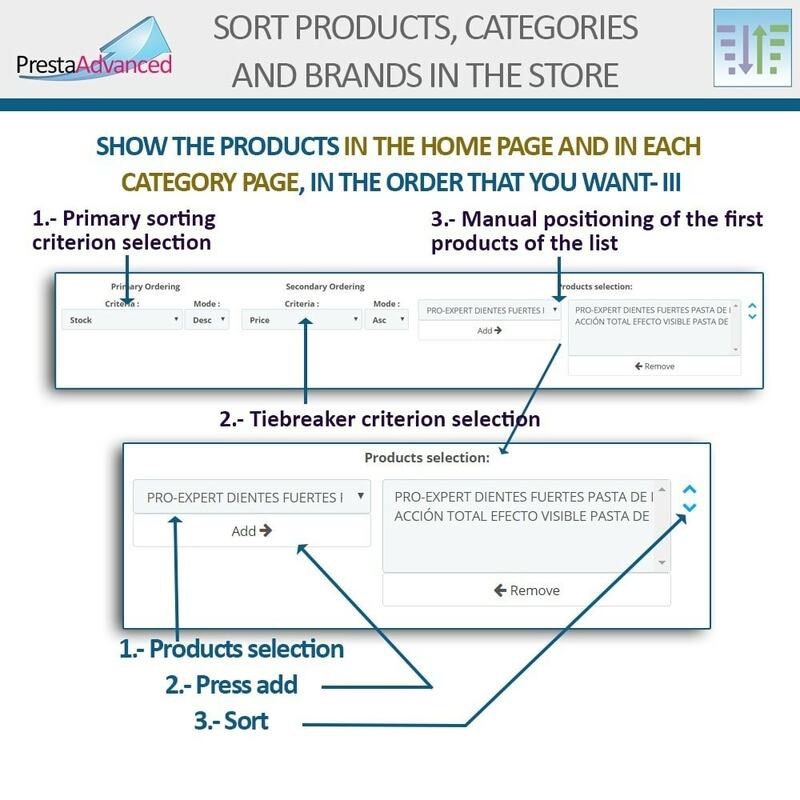 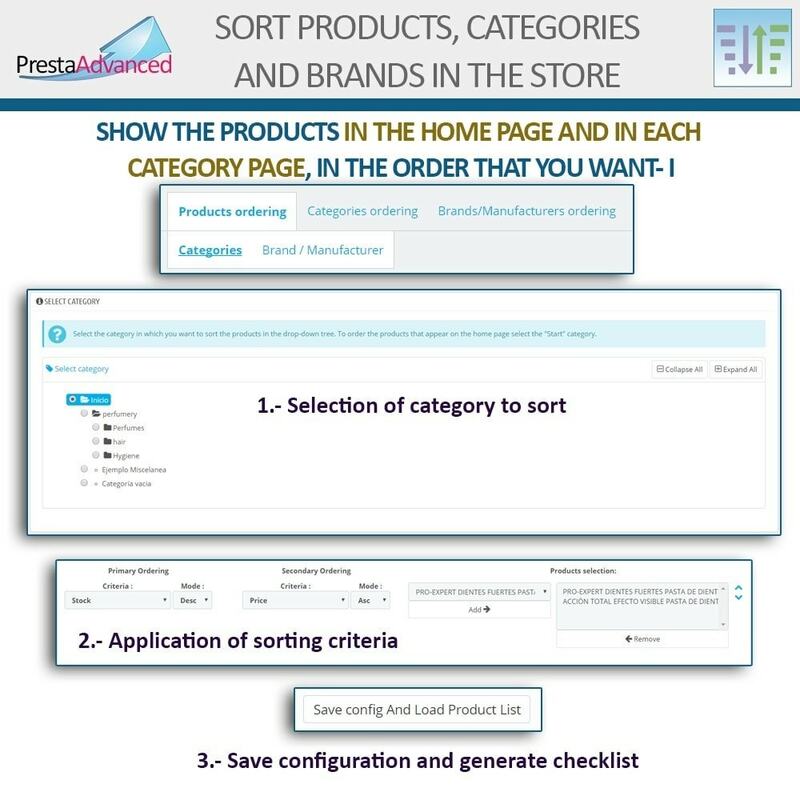 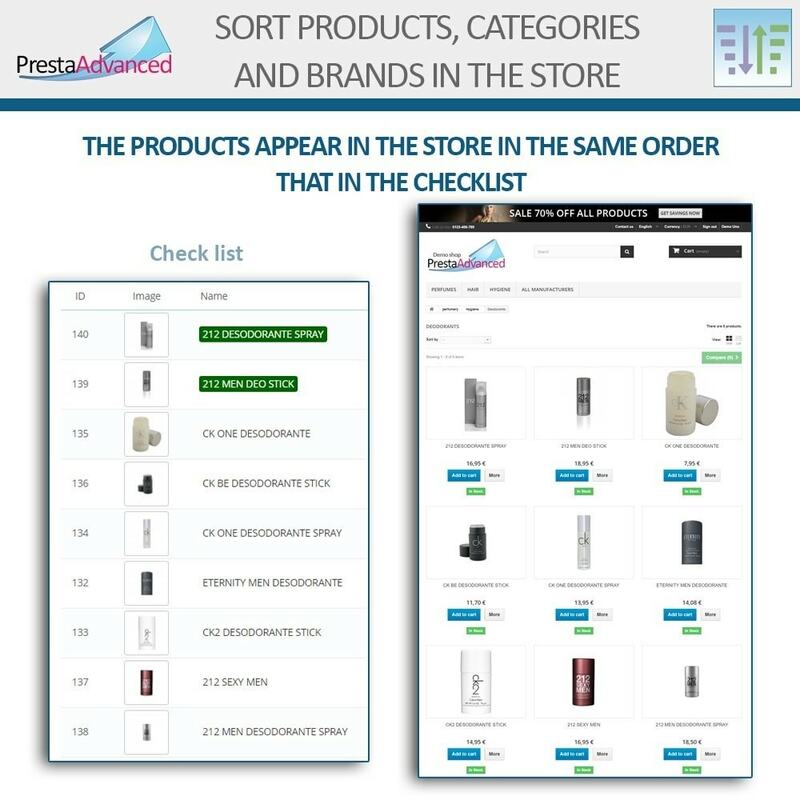 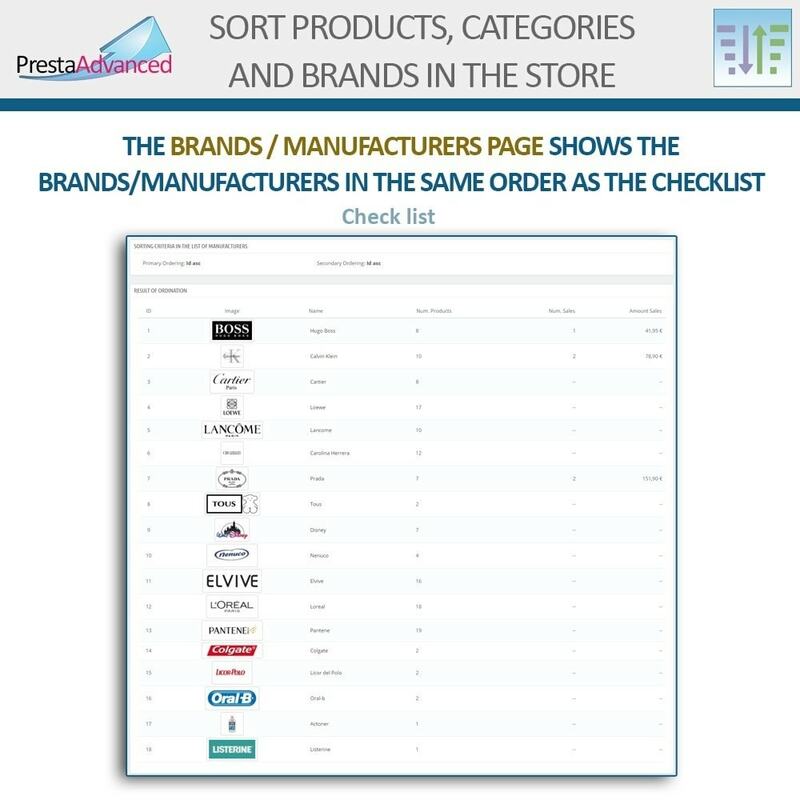 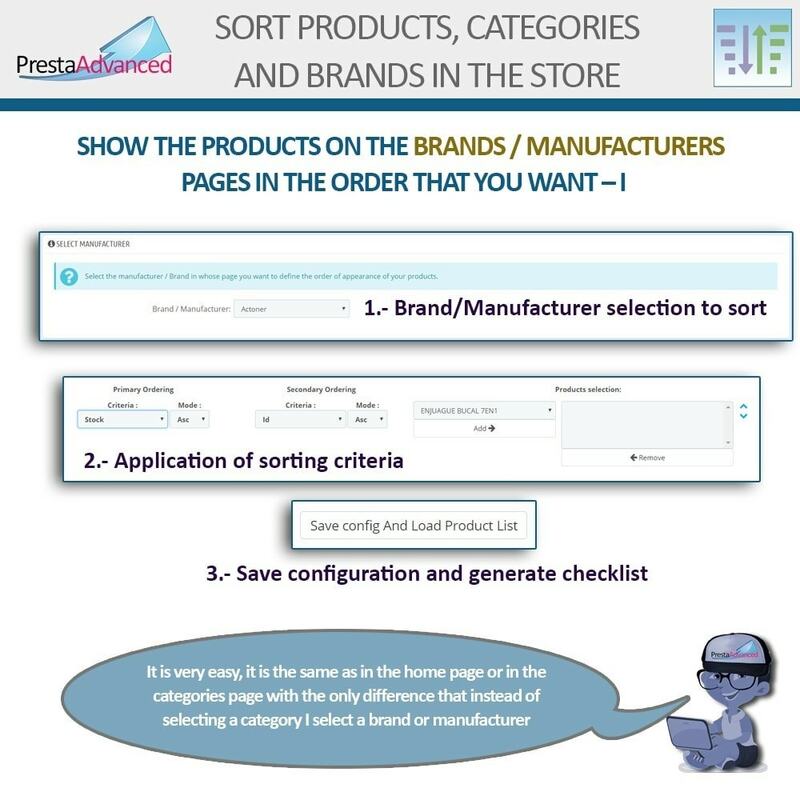 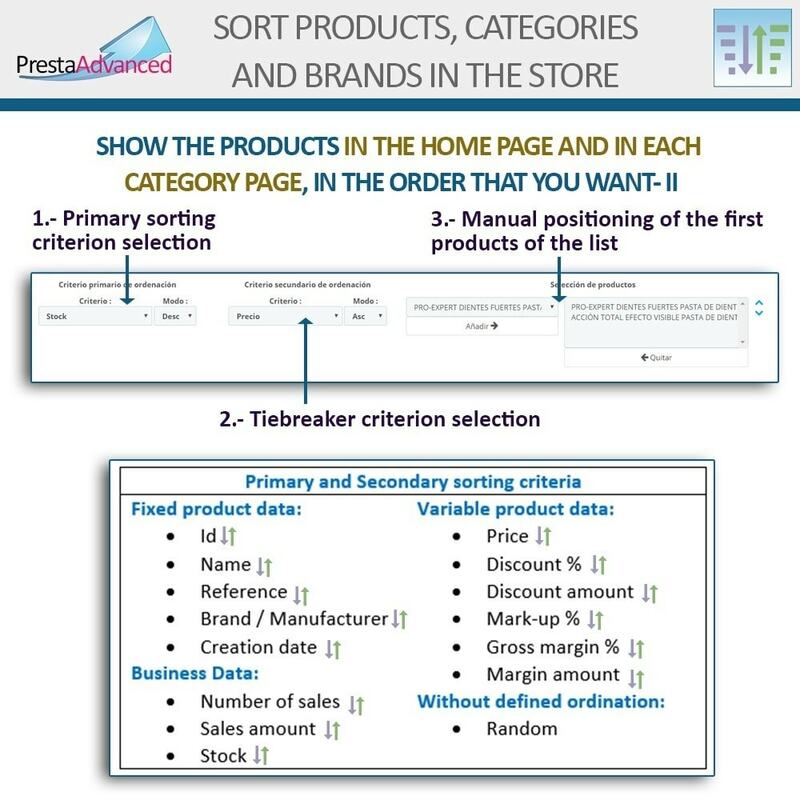 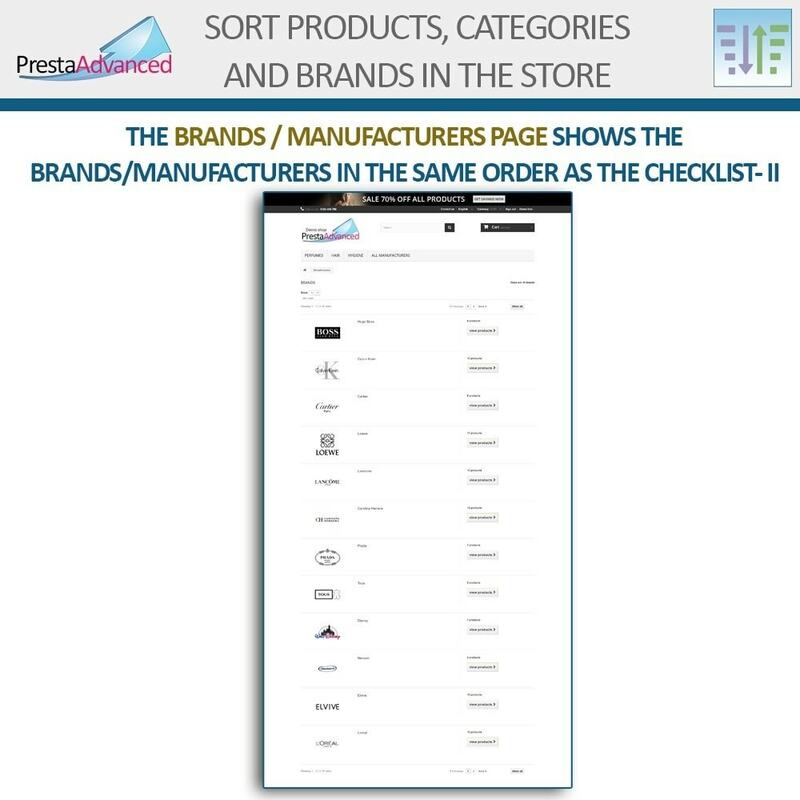 The use of the second sorting criterion allows to define the order of the products that share the same value in the first sorting criterion. 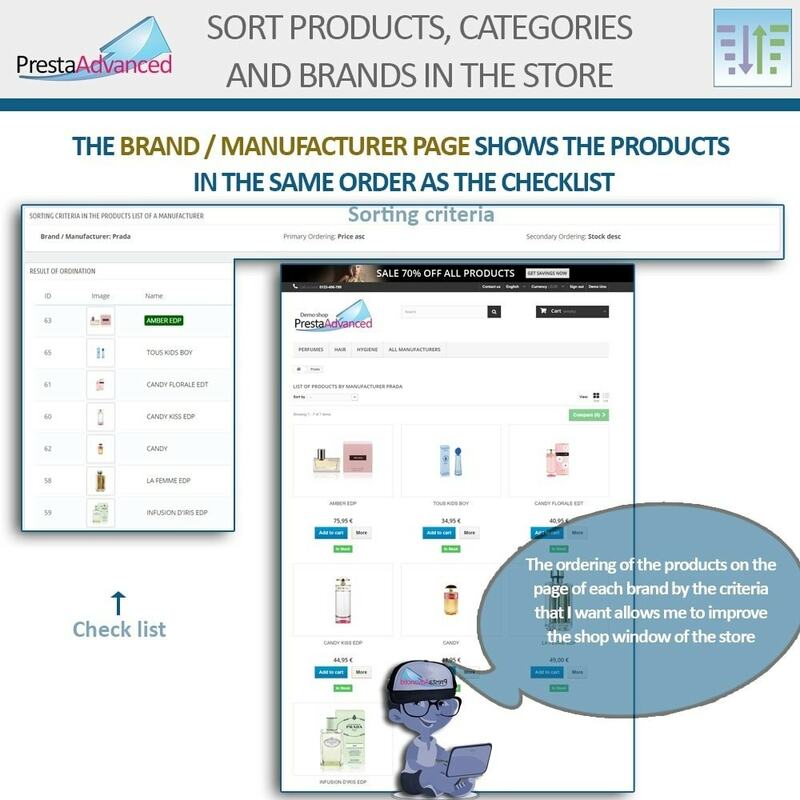 In addition, the merchant can manually define the first positions of the listing to highlight elements that for any reason are desired to appear in the first places, when they do not according to the sorting criteria used. 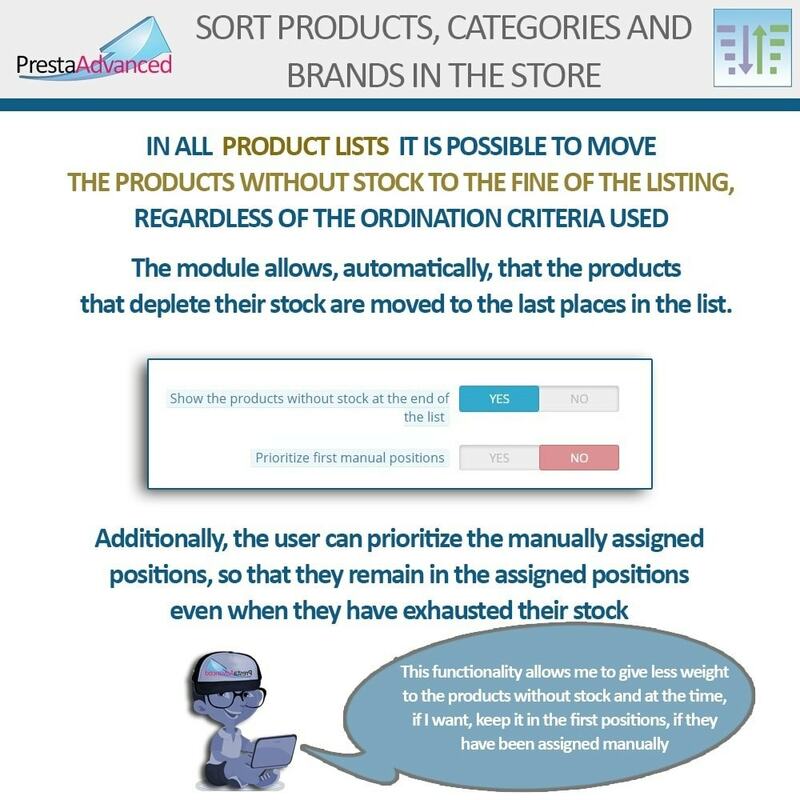 The merchant does not need to reorganize the listings in view of variations of data or new additions since the listings are automatically recalculated using the criteria used and, if applicable, manually defined initial positions. 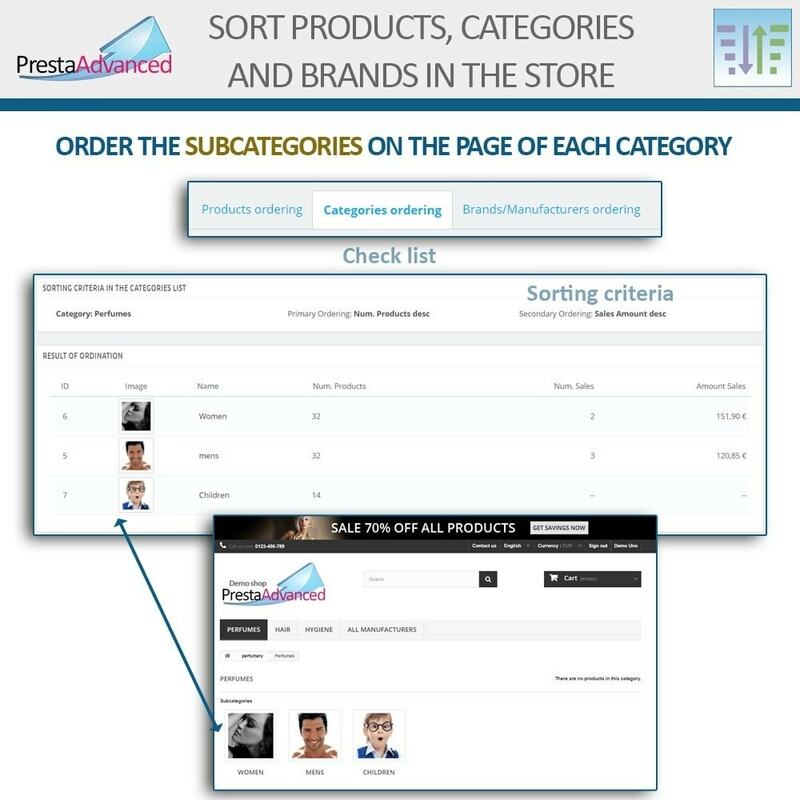 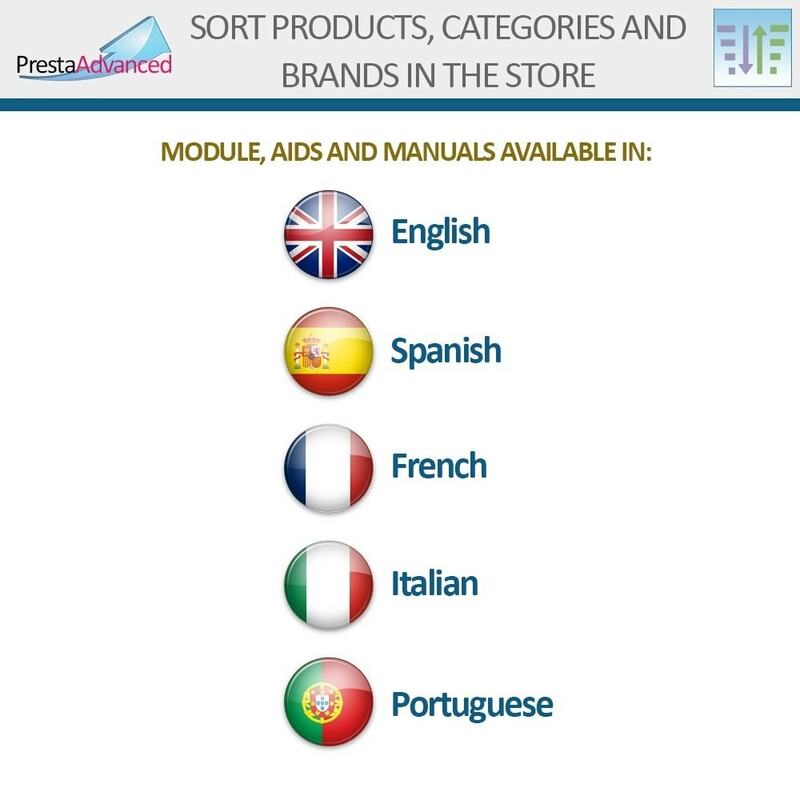 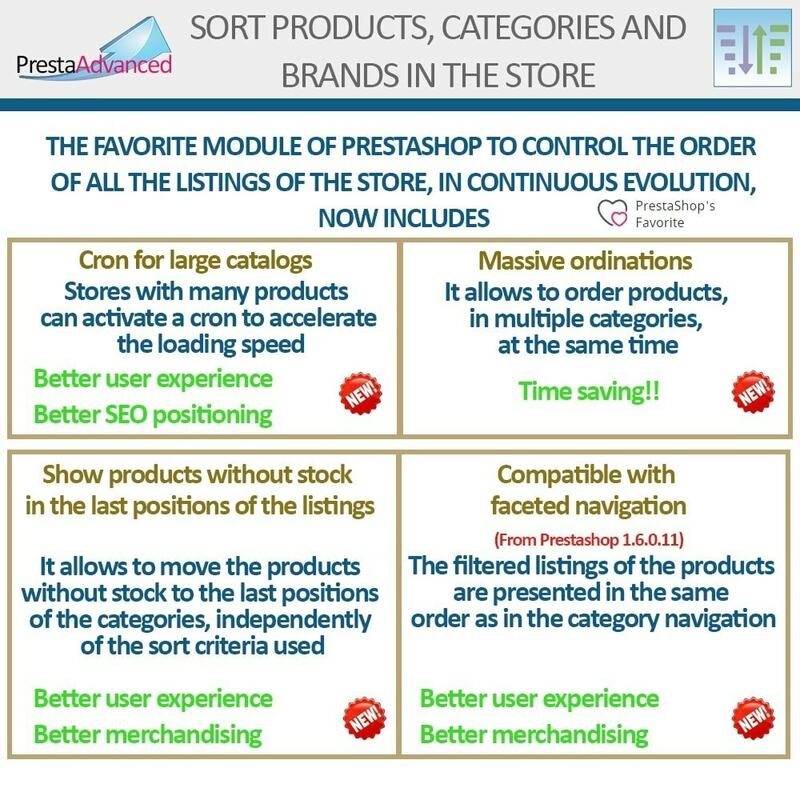 The “Sorting out the lists of the store” module allows you to control the order of appearance of the items in all the PrestaShop's native listings. 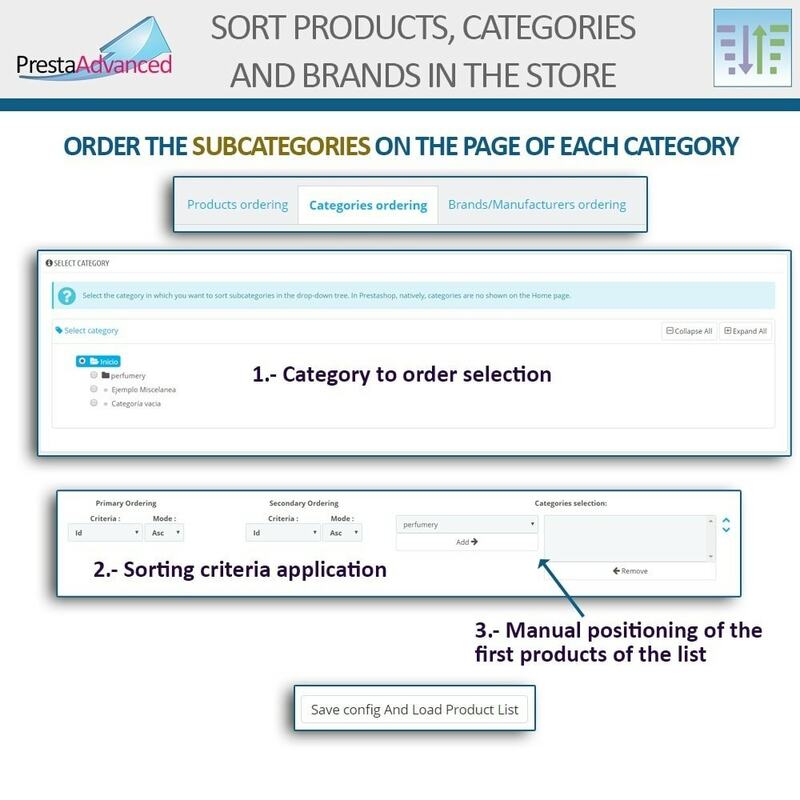 By means of a secondary sorting criterion, it is possible to order products with the same value according to the primary sorting criterion. 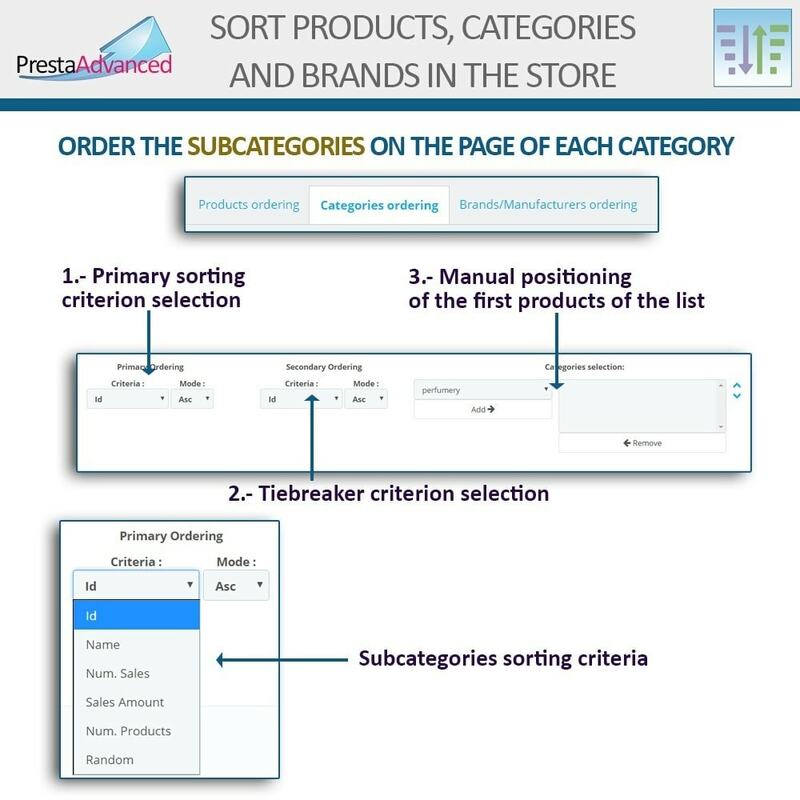 By means of a secondary sorting criterion, it is possible to sort subcategories with the same value according to the primary sorting criterion. 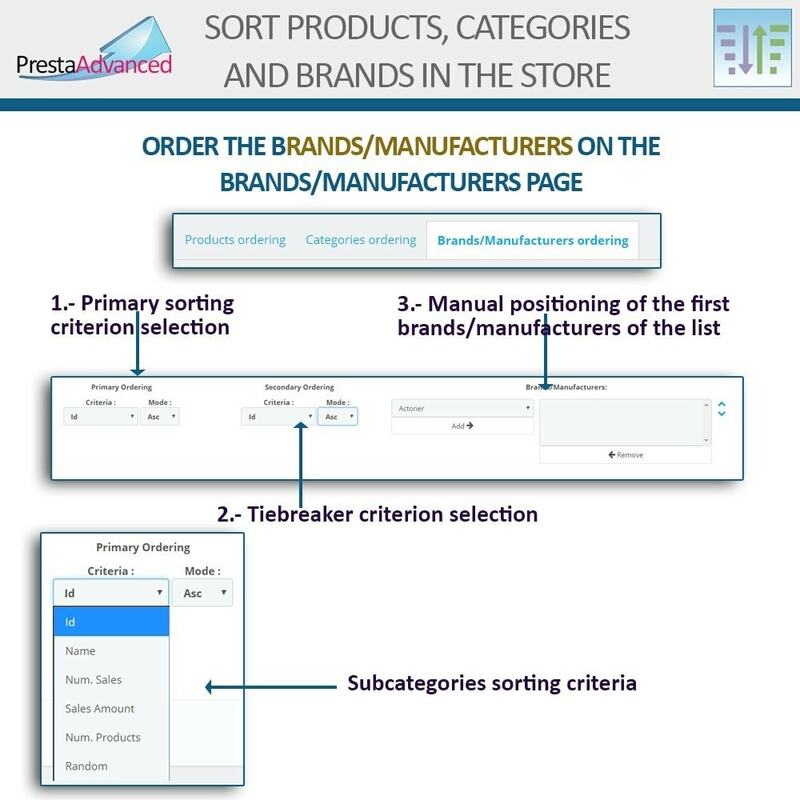 By means of a secondary sorting criterion, it is possible to sort fabricants/brands with the same value according to the primary sorting criterion. 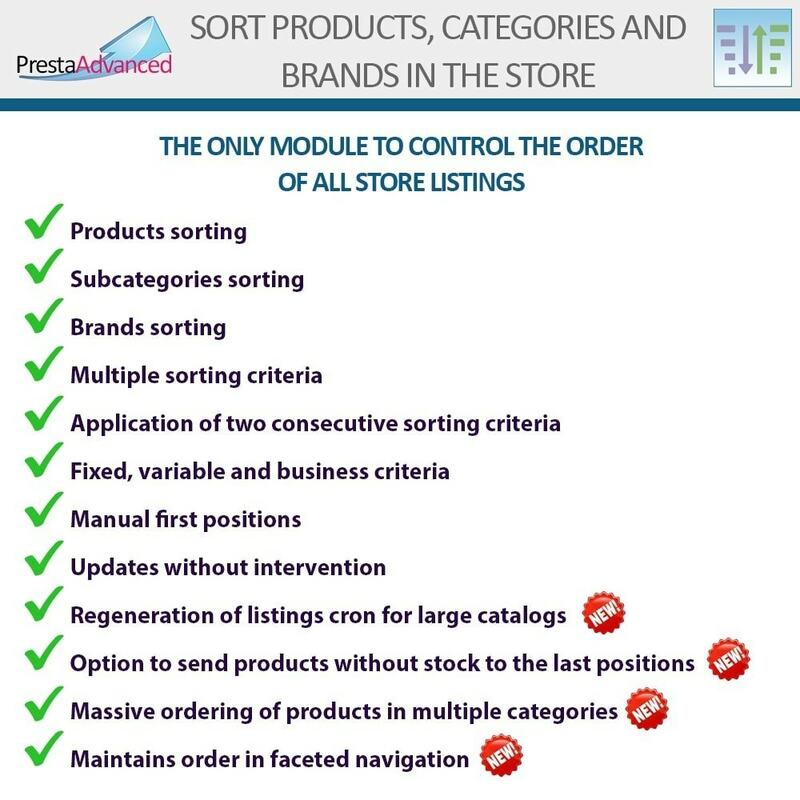 Depending on the criteria selected, the ordering of listings has multiple benefits for buyers. 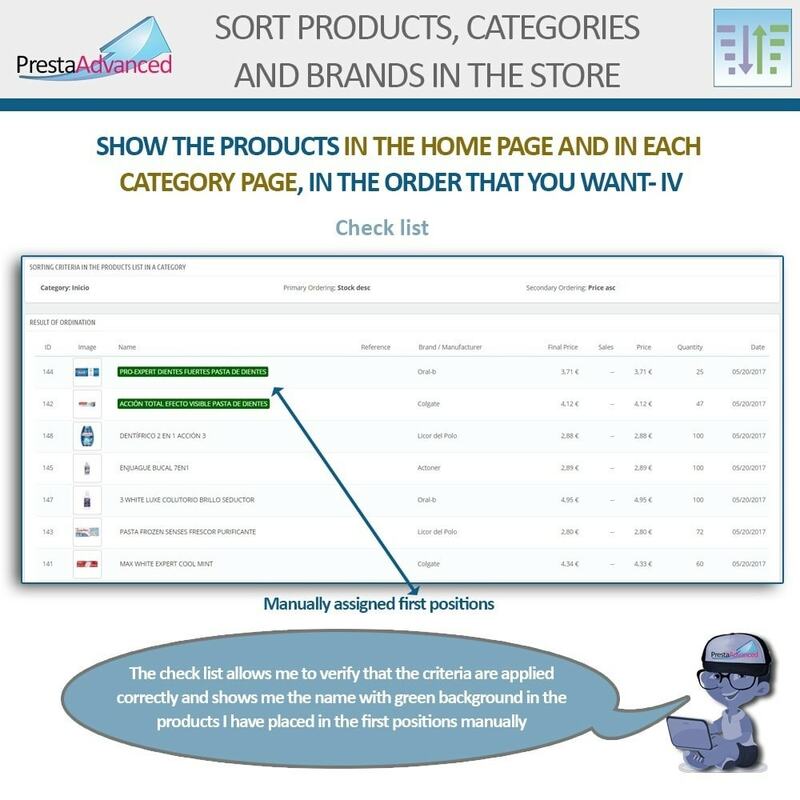 The merchant, by choosing the ordering criteria, defines the benefits associated with the order, both for him and for the buyer.